I want you to love your home. Whether it is a single cupboard, the kitchen or bathroom, a closet or the garage I will work with you on editing possessions, maximizing placement and implementing systems that make things easier. We can work on one space or put together a plan for the whole home. Alone or in conjuction with organizing I can help with the perfect room layout. With my unique skill set incorporating staging and feng shui properties I will design a layout that looks and feels great. Your closet is the first battle you fight each day. 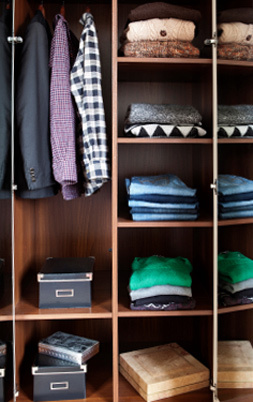 I love designing closets customized to your needs and wardrobe that make it a joy. I have designed hundreds of Elfa closets from The Container Store (yes, they know me by name). You receive the benefit of my experience in what clients love and don’t love plus the customization that comes from having not just a standard design, but one that’s right for you. I have designed clothing closets, pantries, mud rooms, utility closets, shoe closets and even gift wrap closets and a light bulb closet. Are you drowning in papers? Your paperwork is the core of managing your home and personal life. I can help you create filing systems, electronic files, set up a productive desktop, create an In Case of Emergency information plan, mail management and more. Beautiful homes are built all the time lacking the appropriate storage and flow. Small changes before you build or remodel can make all the difference in how your home functions. After an interview about how you want your home to function, I will review your plans and make suggestions before it’s too late. A move is an amazing opportunity to get organized. Imagine carefully edited possessions, packed in an organized manner transitioning seamlessly to your new home. I can help you determine what to take, put a packing system in place, a tracking system for movers, identify space challenges and create furniture layouts for new rooms, evaluate new storage spaces and create a plan to transition closets and storage and make any recommendations for redesigning closets. Why wait until it’s not working? Start your new life organized. As an Accredited Staging Professional (ASP) I can stage your home so it makes the best first impression on potential buyers. Buyers determine if they can see themselves in your home within 20 seconds of entering so let me make sure you create the right environment for your buyer.